When I parked on Constitution this morning to go to the National Museum of American History for the donation event surrounding the First Lady’s inaugural gown, I was expecting to park at a meter that worked. After all, those have to be some of the best moneymakers for the city, with all the tourist attractions. 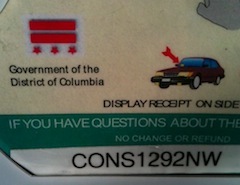 Not only did meter CONS1292NW not work, can you spot the significant problem with the meter’s signage? Yeah, the flag’s upside down. Upside Down! Sheesh, guys, how the hell did this make it through proof-reading? Upside down flag indicates distress, so clearly they put the flag on that way to signal that the meter was broken, right?